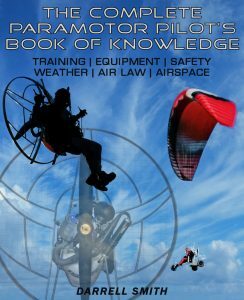 If you're ready to start paramotoring but you're still unsure how a paramotor works you're definitely not alone. I'm forever explaining this to my friends and to people that come to take a look after I land at the airfield. So let's take a detailed look at a paramotor and wing to see exactly how it works. Before paramotoring existed paragliding pilots were using very similar wings to launch from hillsides. The original paragliding wings were very closely related to ram air parachutes and featured a very similar design. These wings created a lot of lift and were capable of staying aloft for many hours by using just wind and thermals. When paramotoring was born paragliding pilots were using these same wings to launch with the aid of a motor. But pilots soon realised wings needed to be much larger and stronger to cope with the extra weight. The modern paramotor wing is made of two layers of tough rip-stop fabric tightly stitched together. Rip-stop is a lightweight, nylon fabric with inter-woven reinforcement threads in a crosshatch pattern, so the material resists ripping or tearing. The top and bottom layers are held together with ribs that form the aerofoil shape and multiple cell openings. These cells let air pass into the wing so that it inflates as the wing moves forwards. The high pressure air that is forced into the wing keeps it inflated until forward motion stops. Attached to the wing in multiple places are the lines which are made of Kevlar and Dyneema. These lines may look thin but they are very strong and will each hold around 400 kg. If you count the number of lines you'll soon realise that a wing is capable of lifting many tons of weight. To fix these lines to the paramotor each line is attached to strong nylon risers. These risers simply hook through carabiners that lock safely together to prevent the wing from disconnecting. Pilots will hold the two main controls in their hands to steer the wing, these are called the brakes toggles. The brake toggles are connected to lines which pull down on the trailing edge of the wing. When the trailing edge drops on one side, that side of the wing will slow down causing the other side to fly faster. This causes the wing to turn by using very light input. Most wings also have a trim system to give the pilot some control over speed. These work by changing the length of the two rear risers, or the C and D risers, which changes the profile of the aerofoil. Releasing the trims can add an extra 7 MPH to the top speed, but they will reduce the glide ratio of the wing. This means a lot more engine power will be required to maintain level flight increasing fuel burn. When the trim system is activated pilots will use two separate controls to steer, these are called tip steering toggles. 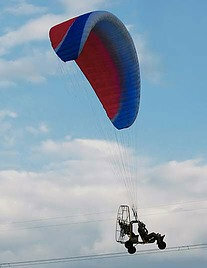 The concept of using engines to keep paragliders aloft for extended periods was first introduced in the 1980's. Since then the basic idea has remained the same and all manufacturers follow the same design. 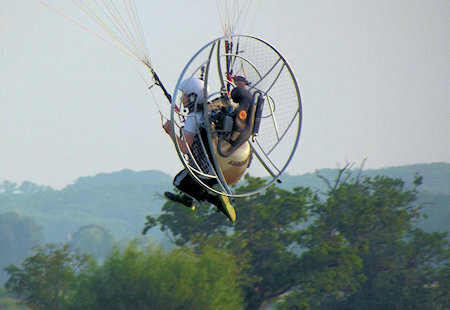 This design is a strong frame with a netted cage to shield the pilot and wing from the propeller, and a powerful engine to push the paramotor along. Paramotor frames are made from strong but lightweight materials, usually aluminium or stainless steel tubing. Some manufacturers are also using carbon fibre and titanium, but these are much more expensive. The cage section is designed to be completely removable for easy transport and storage. Any gaps in the cage are filled with netting to prevent anything from being sucked through into the propeller. This also protects the pilot, and the lines from striking the prop. Older or cheaper paramotor frames will usually be made from standard tube bent to shape and welded. Newer and slightly more pricey models are incorporating aerodynamic design where the frame will be shaped like an aerofoil which reduces drag. 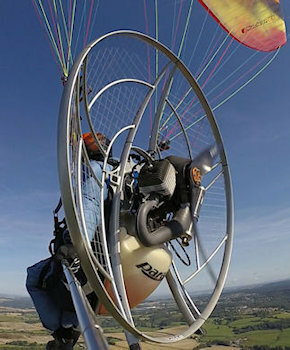 The most common engine fitted to paramotors are single cylinder two stroke motors. These are used because of their low weight and high revving capabilities. The choice of motor will depend on the pilots weight, the heavier the pilot, the more thrust is required. The Vittorazi Moster 185 that you can see in the picture produces 25 horsepower and gives 68 kg of thrust. It uses around four litres of pre mixed fuel per hour of flying, and gives 3.5 hours flight time per tank. Propellers are made from carbon fibre or wood and are fairly fragile. Pilots must be careful not to clip the propeller on the ground during launching and landing as the can break. A new propeller will cost around £300 ($420) so this could be a costly mistake. Four strokes and electric motors are also available. Four strokes are not a common choice because of the extra weight, but they are much better on fuel. Electric paramotors have come a long way but the weight of the batteries limits them to about one hour flight times. Once the engine is attached to the frame the throttle cable runs through the cage to the pilots hand. The throttle is controlled with a simple single finger pull lever, the hand throttle will also have an engine kill switch built in. Some paramotor engines are started with a pull starter just like a lawn mower, some have an electric start motor and battery pack. Electric start paramotors will also have a start button built into the hand throttle making it very easy to stop and start the engine mid flight. Electric start paramotors tend to be heavier because of the starter motor, battery, and extra wiring. Harnesses feature a three point locking system to keep the pilot safely strapped in. Strong nylon straps are used with simple push clip style buckles. The harness is attached to the frame and to pivoting arms that also attach to the wing. This is known as a weight shift harness as pilots can shift their weight to steer the wing. The bottom of the harness will be filled with a rigid board for comfort and to protect the pilot from small impacts during bad landings. The back and shoulder straps are padded with foam for comfort. Most harnesses will also have a small amount of storage space for carrying phones, cameras, wallets, spares, etc. A standard harness will feature two separate leg straps that stop the pilot from falling out. These leg straps are also designed to allow ease of movement for running during launching and landing. There will also be two shoulder straps, a chest strap, and lap strap to keep the pilot safe and in place. The main weight bearing straps are usually linked to second strap for safety and as a backup. There will also be a backup attached to the hang points, these are the straps that the carabiners clip to. 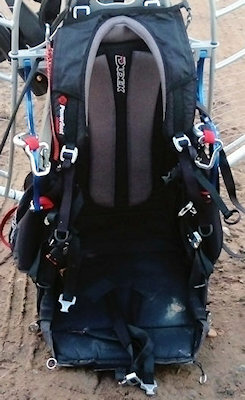 The harness has two extra carabiners underneath the shoulder straps to attach the reserve parachute. The reserve can then be mounted on the chest strap, above the pilots head, or in a container built into the side of the harness. Reserve parachutes are usually a simple jellyfish type chute that can be thrown by the pilot if he gets into trouble. Unfortunately the standard jelly fish style reserve parachute can't be steered, so if you throw it you could land in trees, power lines, or water. There's also a danger of your main wing causing you to swing or enter a dangerous downplane. This is why proper training is essential to teach pilots how to handle the situation should it arise. Newer steerable designs are available but are only usually used be pilots practising acro as these pilots frequently use their reserve. Pilots can also install a cut away or quick-release system to detach their main wing after the reserve has opened. 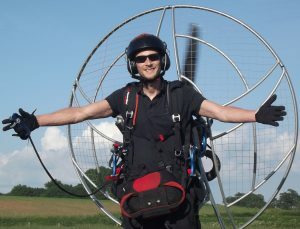 For pilots that don't fancy holding 30 KG of weight on their backs paramotors can be launched on wheels. These are called trikes (three wheels) or quads (four wheels) and they feature a caged motor design attached to a rolling chassis. The wing is clipped to the top of the trike and controlled exactly the same as a foot launched paramotor. These can be flown without a license in the US, but UK pilots may need to obtain a microlight license. A few pilots have recently been granted permission to fly trikes in the UK without a license providing they show a medical exemption certificate. This could include back problems, or any type of disability that may prevent them launching a foot launched paramotor. Trikes and quads are heavier and need a much longer take off strip to get airborne. They may also require a larger wing to accommodate the weight and create extra lift. Trikes and quads give pilots the ability to carry more fuel and equipment. This makes them a top choice for cross country or competition pilots. They're also a great choice for adventurous pilots that enjoy a bit of fly-camping. When you put all of this together the paramotor will be ready to fly! Flying a paramotor is very simple but launching can be tricky. This is the hardest part of paramotoring and it's quite common to see new pilots failing launches over and over again. As we spoke about in the wing section, the wing will inflate as it is moved forwards. So in order to launch, the wing must be pulled into the air with enough force to inflate it and keep it flying over the pilots head. The pilot then runs with the help of the engine until takeoff speed is reached. Once in the air the pilot will control height with the engine, more power equals more height, less power equals a descent. To turn you simply pull the brakes in the direction you wish to go whilst leaning in the weight shift harness. When it comes time to land the pilot must cut the engine to stop the propeller spinning. This ensures no damage will be caused if the wing falls into the propeller after touch down. It also keeps the pilot safe in the event of a trip or bad landing. Pilots then use the brakes to slow the wing and level them out ready for touch down, this is called a flare and is performed at about 4 feet right before landing. Now you know how a paramotor works take a look at this video of me launching my paramotor to see it in action! You can read my full post on launching your paramotor HERE. Thanks for checking out this article! Now you know how a paramotor works you can find out all of the equipment you'll need to get before you can start flying HERE. Still think ultralight aircraft are better than paramotors? Take a look HERE to see which one you should buy! Pingback: What is paramotoring like and is it really something you'll enjoy?